Antlers Park was in Lakeville, built by Marion Savage to provide customers for his Dan Patch Railroad. See much more by clicking on the link. lasted from 1906 to 1911. This 65-acre park was situated on the heavily wooded Big Island on Lake Minnetonka. It was purchased in 1905 and operated by the Minneapolis and Suburban Railroad Co., a subsidiary of the Twin Cities Rapid Transit Co. (TCRT). Park-goers would take the new electric streetcar, which ran just south of St. Louis Park on 44th Street, to the Excelsior Dock, where passengers could take one of 9 streetcar boats (named Minneapolis, St. Paul, Minnetonka, Como, Minnehaha, White Bear, Hopkins, Harriet and Stillwater) to the park. The official opening was on August 5, 1906 . The boats operated until 1926. Patrons were met with such amusements as the “Happy Hooligan Slide,” a “Figure-8 Toboggan,” and a miniature train. The park featured a large music casino, a large roller coaster, the Old Mill, the Scenic Ride to Yellowstone, and a carousel. The buildings has a Spanish mission theme. A 200 ft. tower dominated the park. The price was only 25 cents, including the streetcar ride, and it became clear that it was not a profitable operation, especially after the TCRT also bought the Tonka Bay Hotel. Both the park and the hotel closed at the end of the 1911 season. After sitting abandoned for a few years, the park was disassembled in 1918, its iron going to scrap iron for the (WWI) war effort. Some remaining buildings, including a mess hall, became part of a Veteran’s Camp starting in the early 20’s. The streetcar boats were discontinued in July of 1926. 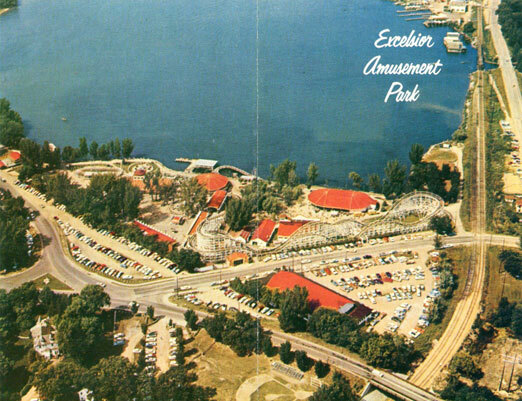 In 1924, Excelsior Amusement Park was built at the site of the waiting station for the streetcar boats. Streetcar boats were revived in 1996. This, the site of many a school picnic and provider of Free Rides for Good Grades, opened on May 30, 1925 with a crowd of 20,000. The property was owned by the streetcar company to create traffic for its routes, especially on weekends. The company contracted with Fred W. Pearce, Sr., of Detroit to operate the park. During his career Pearce built 26 complete amusement parks and 30 roller coasters. Pearce soon purchased the park, and hired his cousin Bill Clapp as general manager. He also hired friend Joe Colihan as superintendant. The streetcar ran from Minneapolis down 44th Street in Edina just south of St. Louis Park to the park until 1932, when it was replaced by a bus from Hopkins. In 1933 you could see Capt. Jack Payne leap backward from a 100-foot ladder into a tank of blazing fire – THRILLING – DARING – DEATH DEFYING! You could also see Smith’s diving ponies leap from a tower 55 feet into a shallow tank of water. Other attractions were Fred Reckless on a swaying pole in 1932, and Prince Nelson, who walked the tightrope 80 feet above the ground without a net in 1931. 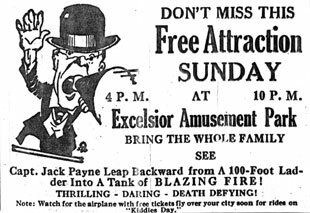 One of the biggest attractions was the wooden rollercoaster, first called the “Mountain Ride,” then the “Cyclone.” (Folks in Excelsior just called it the Roller Coaster.) It was designed by John A. Miller and completed in April 1925. Pearce built the coaster on what had been swamp land. At a height of 65 feet it was called the highest roller coaster in the Northwest. (A higher one was built in Detroit, at 110 ft., but it was dismantled in the 1920s.) The coaster at Excelsior was 3,000 ft. long. While Pearce claimed he built the world’s first large roller coasters, he credits the invention of the device to the Russians. One memoir says that in August 1928 a cyclone hit the park and blew the coaster apart, strewing parts onto the highway. It took ten carpenters, six laborers, and three electricians to put it back together again. When the park closed it was torn down in the winter of 1974. The other favorite attraction was the merry-go-round, made of handcarved wood by Italian craftsmen. Fortunately, the carousel was saved and sold to Valleyfair, which opened on May 25, 1976. The horses were restored by Ray Bahmer of Hopkins during the winter of 1974-75. The building where the carousel was housed was sold to a farm near Victoria, Minnesota, where they reassembled it for a show ring for real horses. For many years in the 1940s and ’50s the Miss Minnesota (Miss Universe) pageant was held at the park. Hopkins girl BeBe Shopp was crowned Miss Minnesota in the park in 1948, and went on to become Miss America. Across the street from Excelsior Park was the Danceland Ballroom. It closed in 1968 and burned to the ground on July 8, 1973. 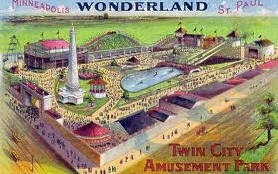 There has been much written about this park, including A Picture Book of the Excelsior Amusement Park.. from Rise to Demise by the Excelsior-Lake Minnetonka Historical Society, 1991. 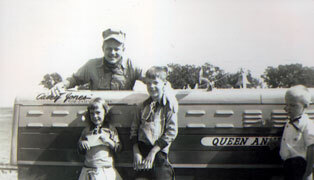 During the 1950s and ’60s, many Edina children celebrated their birthdays with a party at Queen Anne Kiddieland, a wonderland of ponies, amusement rides and the Rock Island Rocket, a miniature 1/6 scale replica of a real train. The train was then called the Casey Jones Flyer, in honor of the popular kids’TV host Casey Jones, whose show entertained kids at lunchtime in the Twin Cities. Casey, a railroad engineer character played by actor Roger Awsumb, drove the train around the track every Sunday to the delight of his young fans. “We were packed most every Sunday,” said Boyd Thomas, who as a high school kid helped his father Frank run the pony rides at the busy amusement park, which offered party rooms and ticket specials for birthday celebrations. The park provided summer entertainment before modern amusement parks like Valleyfair opened. Kiddieland’s rides were smaller, but even teens hung out there to flirt and find dates from other towns. 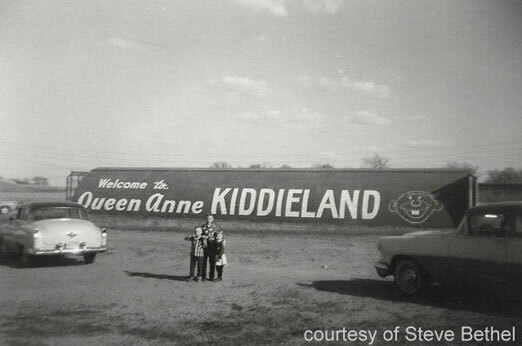 Visitors recall that Queen Anne Kiddieland seemed to be in the middle of nowhere at the southeast corner of what is now the intersection of Interstates 494 and 100. But then, the land was in “the country.” In fact, the ponies came from Thomas’s 80-acre farm located a few miles away, at 78th Street and France Avenue in Bloomington, where he raised dairy cattle and hay. By the end of the 1960s, however, the 494 strip transformed, thanks to crowds at the new Metropolitan Stadium, freeway construction and the population boom. An office tower now stands at the Queen Anne Kiddieland site, but those who want to recall their past can still ride on the Rock Island Rocket which is now housed at the Jackson Street Roundhouse in St. Paul. The park was owned by Tom E. Casey and his wife Anne, whom he referred to as “Queen Anne.” After the land was taken for the highway, the park moved way out to Blaine, truly the middle of nowhere at the time. The Caseys were true entrepreneurs; they built the Queen Anne Courts manufactured home community that is still in operation in Lakeville. Casey was also an avid ham radio operator, and once got in trouble with the city for erecting a radio tower at his home on Kipling Ave. Anne Casey retired to Arizona and died in 2011. Here’s a film from 1965 for those of you on Facebook, courtesy of Jeff Kleinbaum. was on the south shore of White Bear Lake in what is now the City of Mahtomedi, Minnesota. It was there from roughly 1898 to 1938 and was quite a popular place. It was much like Excelsior Amusement Park on Lake Minnetonka. The park was owned by the Twin City Rapid Transit Corp.
was built by H.A. Donnelly on 10 acres at East Lake Street between 31st and 33rd Avenues, in today’s Longfellow neighborhood of Minneapolis. The park, which lasted from 1905 until 1911, featured a 120-foot-high electric tower which drew in visitors, roller coaster, miniature train, a floating theater, and the “House of Nonsense.” The most popular attraction was an exhibition of premature babies in incubators, a common curiosity of the times. More than 70,000 visitors attended the park on opening day. For a video, click here.